On an August night in 1946, a crowd of people gather where the paving branches off into two paths in Cadigal Green. They stand inside Darlington Town Hall, an unassuming one-storey brick building whose façade only half-heartedly aims for grandeur. In front of them, the mayor reads choice quotes from an article published about the suburb in the Daily Telegraph the Sunday prior—“Guide to Darlington (Not for Tourists): Life is Tough in This Forgotten Wedge of Sydney”. After each quote, the hall erupts in jeers. The article paints Sydney’s then-smallest suburb as a flashpoint of violence, drug addiction and juvenile delinquency. An account of a woman’s death on Rose Street, where the Engineering Walk now lies, declared that it was “typical of Darlington—a middle aged woman… battered to death among a litter of methylated spirit bottles”. This wasn’t the first time Darlington had been publicly spurned. In 1864, Darlington’s application to become a part of the City of Sydney was rejected. The residents formed their own tiny municipality in response. Yet, a century later, the people of Darlington were forced to defends themselves yet again. The article’s claims of unusual crime levels of violence had been denied by the Police Inspector, while various residents had attested to the suburb’s community character. A resolution passes threatening to blacklist the Daily Telegraph in Darlington unless it issued a retraction. The account finishes with an invocation attributed to a local doctor: “Darlington should be demolished and carted away, or perhaps just burnt to the ground”. This last quote draws a special uproar from the crowd. Little do they know that less than 20 years later it would prove prophetic. 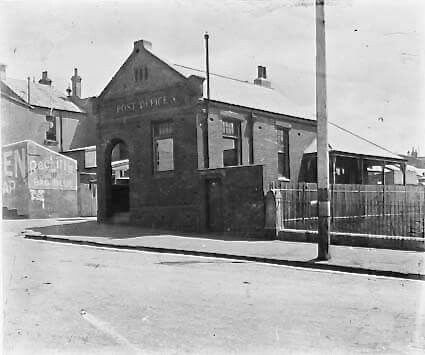 Darlington’s terrace houses now stand as a symbol of its gentrification, but at the time, the originals housed mostly working class families; many of whom worked at the local IXL fruit canning factory or at the Eveleigh Street Railway Workshops. The University of Sydney hovered on the City Road edge of Darlington—as one resident recalled, “we never thought about going over there… you knew it was a university, you didn’t go near it.” Darlington remained staunchly working class in the 1930s and 40s; many of its residents widowed or single women working factory jobs or surviving on low government pensions. By the 1940s, the suburb was regularly being mentioned in the press as a centre of growing communist influence. Over 100 copies of the Communist Tribune were being sold each week, and a local communist branch was established the same year as the Daily Telegraph article. At a 1947 Sydney town hall rally, political activist and fierce communist, Freda Brown, reminded the 3000 attendees standing before her that 90 per cent of Darlington’s residents battled leaky roofs when it rained, while many plots of land held three houses apiece. Meanwhile, she continued, only one per cent of school children in the area would end up studying at the University. It was not only the communists, however, that sought to utilise Darlington’s living conditions for political ends. A middle class slum reformer movement also set its sights on Darlington, as part of a nationwide push to move the inner-city poor, and re-establish the area into a picturesque, white picket fence style ‘garden suburb’. The slum became shorthand for concentrated working class vices that threatened the character of the nation and civilisation itself, and religious charities argued that “the abolition of the slums would be a Christian answer to Communism”. However, dissenting voices pointed out that it was poverty, rather than a slum environment, that bred social disadvantage. In the words of influential Sydney planner John Sulman, “by far the greater majority living in these crowded areas are not ‘slum minded’; they are simply poor”. He attributed the existence of slums to unemployment and low wages. Far louder in the press, however, were the voices of slum reformers. An entire ‘slumland’ genre developed in city journalism, with Darlington becoming a frequent target. The Daily Telegraph’s attacks persisted. Responding to the residents’ protests, the reporter wrote that the “healthier setting” of Parramatta, Blacktown, Penrith and Emu Plains would help rid the people of Darlington of their vices, if relocated. By 1948, this wish was granted. The then Minister for Housing announced that the slum suburb should be rebuilt from scratch in the next 20 years. Similarly, a 1949 report by the Cumberland city council declared that Darlington had 1.99 delinquent children to every 1000, compared to Mosman’s 0.08. Addressing the principal causes of poverty took second place as the clearing away of slums became the chief way to ‘save children from delinquency’. Nine years later, USyd swept on the scene. Enrolments had risen to 10 000, the institution needed to expand, and Darlington was a ready target. An additional 70 acres of surrounding area to main campus, including a large chunk of Darlington, was zoned as ‘Special Uses – Educational and Medical’ by the City of Sydney, allowing the University to have first pick of properties that came onto the market. There was no public consultation for the 1958 expansion plan. While owners and renters were ‘helped’ to move into other areas, some displaced tenants moved into University-leased houses and spent scarce money improving them, only to move again after 18 months due to changes in the agreement. Many of these families had been assured by the University that their properties would not be affected for another five or six years. In 1960, the University was permitted to purchase acres of land without usual planning regulations: 416 houses, 47 factories, the Darlington Town Hall, public school, and a post office. Resident reaction was strong. According to University development report notes from the time, the expansion had been hampered by “antagonism from citizens in affected neighbourhoods”. Jennifer Sams, a member of local community group REDwatch, recalls hearing that “people threw themselves in front of bulldozers to try to stop the destruction”, while students squatted in the last two terraces on Rose Street in protest. Lobbying to the Sydney City Council after the 1958 announcement resulted in the University Expansion Area being reduced from the initial 70 acres to 36. This was a temporary appeasement. In 1968, a further nine acres were added again, extending the UEA to Golden Grove Street, now behind the Abercrombie Building. By 1975, the entire Engineering faculty had been relocated to new premises in Darlington, just as the University was instructed by the Commonwealth to halt expansion. A Sydney City Council report the next year recorded widespread community resentment and fear of the University; as one resident interviewed said, “you never knew when they were going to take over… you always knew that you could be asked to leave, after a certain time”. Tensions ran so high, that University authorities began locking gates along Darlington Road between 3:30 and 3:45 pm to prevent Darlington kids from using their grounds as a shortcut home from school, blocking off previously public roads with security guards. As time passed, some concessions were made. Part of the original Darlington Public School building was preserved for use by the Music Department, demonstrating the University’s first reluctant obligation to preserve some of Darlington’s past. The Darlington Heritage Conservation Area, bounded by Cleveland Street, Little Eveleigh Street and Boundary Street, is now recognized by the NSW Department of Environment & Heritage as a historically significant representation of 19th century working class housing. Yet even the shift towards heritage recognition points to the success of the University’s expansion in pushing out previous, undesirable locals. By 2001, Darlington’s population passed just over 2000 people. These residents were twice as likely as the average Sydneysider to have a tertiary degree, while 39 per cent identified as ‘professionals’—a 17 per cent higher figure than the city average. Passing through the Darlington campus today, you walk through streets that still conserve the suburb’s historic layout. REDwatch’s Jennifer Sams alerted Honi to a list of past addresses set into the pavement outside Abercrombie, from prior to the building’s construction. “If you don’t look carefully, you will walk over it and miss it,” she says. Maze Crescent, named after the University’s 1950-55 registrar, sits on both Alma Street and parts of Darlington Road, while the Engineering hub stand on the former Rose Street. The historic tributary of Darlington Street is now interrupted by the Seymour Centre and Gordon Yu Hoi Chiu Building. The remaining dregs of old Darlington have been integrated as landscape planning to mark the University’s prestige. “The ‘grimy’ past is often preserved in token gestures,, says UNSW Associate Professor Wendy Shaw. “Remembering the harshness of the working conditions, and the lives of the people who worked in those spaces are not great for real estate sales”. Architectural descriptions of the new Maze Green prides itself on the Darlington school, ‘once crowded by densely packed late-Victorian houses’ and now the focal point of a parkland setting with a wetland moat—liberated from its working-class environment, it becomes a worthy showpiece. The boardwalk leading into the Darlington campus “conjures the lost beauty… of the area’s working-class history”, an architectural development of the redevelopment described; its rusted Corten blades referencing the nearby machine sheds. 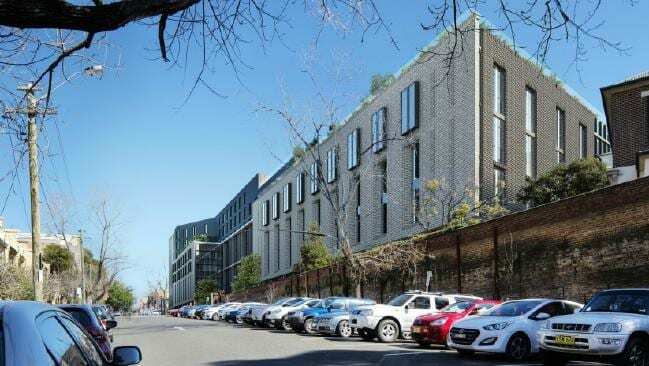 The 38 Darlington Street terraces now house students, charging up to $255 per week. The University plans to once again redevelop the terraces next year. This time, they are strictly guided and limited by a heritage assessment which prioritises everything from preserving the terraces’ architectural character, to reusing original walls and staircases in their restoration. Nevertheless, their backyards will be entirely subsumed with more new accommodation. The battles currently being fought with Darlington residents are still heated, but of a different character—In 2010, Michael Spence admitted that the University “is ashamed of not being good neighbours” in the past, and committed to building stronger community roots. Two years later, the SUSF sport and aquatic centre proposed glass-front was scrapped when churchgoers believed it would be inappropriate for the building to face the Greek Orthodox Church on Abercrombie Street. Perhaps these small, dialogic steps are a reflection of the lessons the University has learnt over the decades. Or perhaps, being better neighbours is reserved for the palatable middle class; those whose kids are not the juvenile delinquents, potential communists or future targets of conservative media panics. The Darlington slum threat was contained, and the effects of poverty, if not diminished, were at least cleared out of inner city sight. 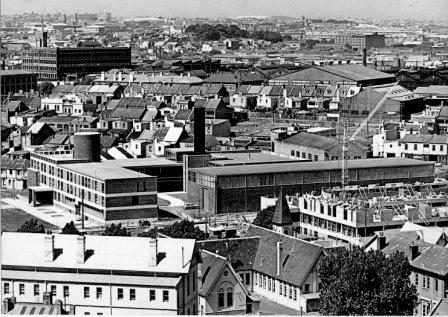 Demolished and carted away, working class Darlington remains only as pockets of heritage and open spaces which echo with the voices and lives of Sydney’s undesirable communities. Editor’s Note: For reasons of brevity, the print version (Week 9, Semester 2, 2018) of this article is shorter than the online version. The latter is the original version of this article.